Whether you’re an avid news-reader or glance at the front page every now and again, you’ve likely heard about the water quality in Rio De Janeiro. It’s bad. Really bad. And, with the Olympic Games coming to roost, it’s still not clear how many athletes will pull-out due to the unsanitary water conditions. If you haven’t been keeping-up, here’s the basic facts: Rio’s water is polluted — really polluted. The Associated Press (AP), which has been conducting studies of the water quality, says “don’t put your head under water.” That’s because raw sewage, which is routinely dumped into the ocean, has contaminatd the water with extraordinary amounts of bacteria and viruses. Luckily, in Hawaii, we have a fantastic sewer system and water-treatment operation. But, you may be wondering: Which beaches have the cleanest water? Kona Coast: Some of the best snorkeling spots on the Big Island include Mahukona Beach Park, Maikaiwa Bay, Honaunau Bay, Kahaluu Beach Park and Kealakekua Bay. Hapuna Beach: One of my favorite (and most picturesque) beaches on the Big Island, you’ll find a long, wide beach and crystal-clear water. Maniniowali Beach: You’ll find a wide sandy beachfront and clear, aqua-blue water here. Kikaua Beach: This is a great beach for families and children because the beach is a protected cove. 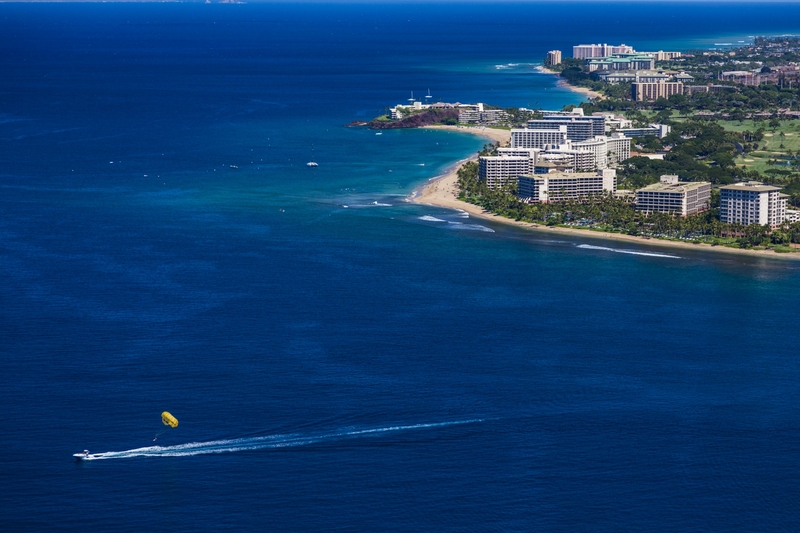 Kaanapali Beach is one of the most popular resort areas in Hawaii for a reason: the water here is crystal clear. Turtle Town, Maluaka Beach, and Honolua Bay: These are all great spots for seeing green sea turtles, as well as numerous fish species. Kaanapali Beach: If you don’t mind the myriad of hotels and resorts in the area, this is a fabulous, clear snorkeling spot. Snorkelers will find three miles of clear waters to explore here. Molokini is a small crescent-shaped island is situated about three miles from Maui’s southwest coast. Molokini is said to have some of the clearest water in all of Hawaii with visibility depths of up to 200 feet. Molokini is a state-protected animal sanctuary and no fishing is allowed. Lanikai Beach: Lanikai Beach on Oahu’s windward side is one of the most beautiful and popular beaches on Oahu. It’s a mile-long beach lined with coconut palms and sparkling clear water, which makes for amazing photos. Beware: Parking can be busy and difficult to find. Kahe Point Beach Park: Kahe Point Beach Park has an abundant fish population and visibility is better here compared to many of Oahu’s sister beaches. Poipu Beach is a great place for beginning snorkelers, since it's a protected cove. 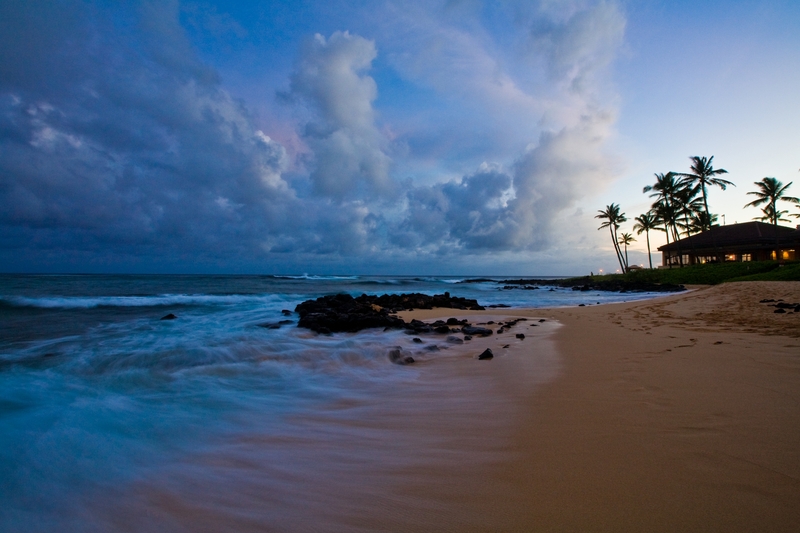 Poipu Beach Park: Here, you’ll find a nice, family-friendly beach that is a protected cove. It’s a great place to teach your kids how to snorkel. Salt Pond State Park: This beach features a long stretch of white sand, plus tide pools toward the east end of the beach. The beach is protected by a reef, which makes for great snorkeling. Hanalei Bay Beach: Hanalei Bay Beach is on Kauai’s north shore and offers clear turquoise waters and waterfalls with a cooling mist. Hulopoe Beach Park: The Four Seasons Resort at Manele Bay is fronted by this beautiful beach, which features Sweetheart Rock at the end. Lots of families frequent this fabulous beach, which offers views of spinner dolphins, if you’re lucky! Clear, pristine water is what it’s all about when you visit the islands, especially if you love looking at marine life. So, take our list of the clearest beaches in Hawaii, and snorkel away!